While the love between a bride and groom can be over-reaching and based on a wide range of things, it is often the small connections or shared interest that really brings them together. This is why many couples decide to focus on a minor aspect of their love and use this as a way to show the world how they really feel about each other. It is difficult, if not actually impossible, to capture a love in every detail, so it makes sense to present it in a way that people can understand and relate to. The Florence wedding invitation from Chapter One Press, is stylish, simple and straight to the point. There is a classic sense to this card, which focuses on a botanical garden look and identity. 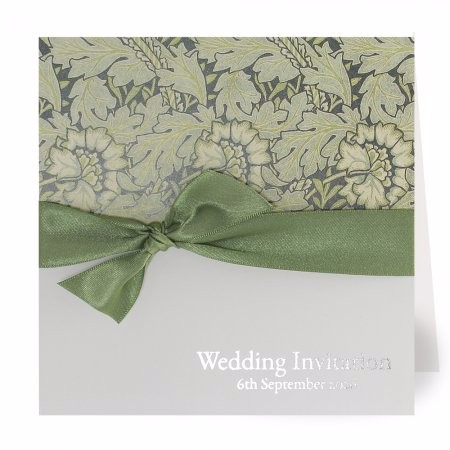 If the happy couple shares a passion for flowers, spending time with nature or the past, the top folding wedding invitation is going to provide them with a fantastic way to share their love and welcome people to their wedding ceremony. The feeling of nature and vitality of life is complemented by the green ribbon and the personalised text, which comes in silver foil, provides a touch of class to the front of the card. The level of greenery involved with the card makes this invitation a perfect choice for spring weddings when nature comes to life after a harsh winter. All of the information that needs to be provided is included on the inside of the invitation, ensuring the front has a charm and an appeal that can stand alone for a long time. The Florence range provides a great deal of stationery products, so if you are looking to communicate with your guests and create a strong theme to your wedding, this is an ideal way to do so.